Funding allows Pittsburgh startup to accelerate robot production for mobile manipulation platform. IAM Robotics LLC, which develops a flexible mobile robot platform that picks items from shelves in warehouses, today announced $20 million in new funding. The company plans to accelerate robot production and expand its sales, marketing, and delivery organization to work with distributors within the supply chain. The investment comes from KCK Ltd., a family-owned investment firm with investments in industrial, scientific, financial services, and medical technologies. 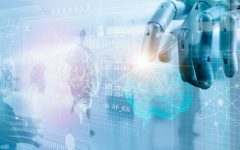 Joel Reed, CEO and president of Pittsburgh-based IAM Robotics, said the investment validates the idea of autonomous mobile manipulation in robotics for companies across the supply chain landscape. Founded in 2012, IAM Robotics develops the Swift system, an autonomous flexible mobile picking robot that can scan shelves for products, pick them, and move to other locations. It differs from other mobile robot systems that rely on human pickers, such as those from 6 River Systems, Fetch Robotics, and Locus Robotics. The company was founded by Tom Galluzzo and Vladimir Altman, who worked at Carnegie Mellon University’s National Robotics Engineering Center. 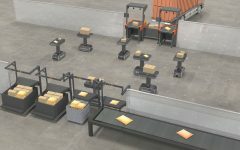 After working on projects related to computer vision, embedded systems and autonomous manipulation, the two were asked by a customer if they could develop a robot that picked items from warehouse shelving, which led to the development of Swift. IAM Robotics develops a flexible, mobile piece-picking robot for e-commerce and warehouse operations. Reed said the IAM Robotics system sits between large systems with shuttles that automate the entire process for e-commerce and retail fulfillment, and automated mobile robots or carts that work with human pickers. Galluzzo, the co-founder and CTO of IAM Robotics, said the flexible mobile system is expanding the applications for autonomous robots. In addition to the new funding, IAM Robotics recently announced a partnership with DB Schenker, in which the two companies would bring robotics technology into its logistic operations. Reed said the new partnership is an indicator of how distributors and systems integrators are understanding the mobile autonomous systems market. One of the reasons why companies are looking at flexible mobile systems is because business models in the supply chain and logistics space are changing on a regular basis, Reed said. With the additional investment, Reed said the company plans to focus on increasing robot production for existing and new customers, as well as expanding the team in areas of software engineering, mechanical engineering, product management, sales, marketing, and field support. On the software side, Reed said the plan is to strengthen enterprise software capabilities, as well as adding business intelligence capability to the overall system. With a flexible mobile system that appeals to large, global organizations in addition to small and midsize companies, Reed said the team needs to stay focused on its goals. “We have to be very careful to make sure that we gain market share in a manageable way that allows to grow appropriately and to achieve profitability,” he said.